Donald Trump, famed for his appearances in The Little Rascals and Home Alone 2: Lost In New York among others, has become an honest-to-God factor in the 2016 presidential election by virtue of saying whatever comes into his head, the more offensive and sound bite-ready, the better. Now, thanks to a man named Phillip Pastore, users can turn the tables and make the Donald say whatever comes into their heads, no matter how off-message it is. 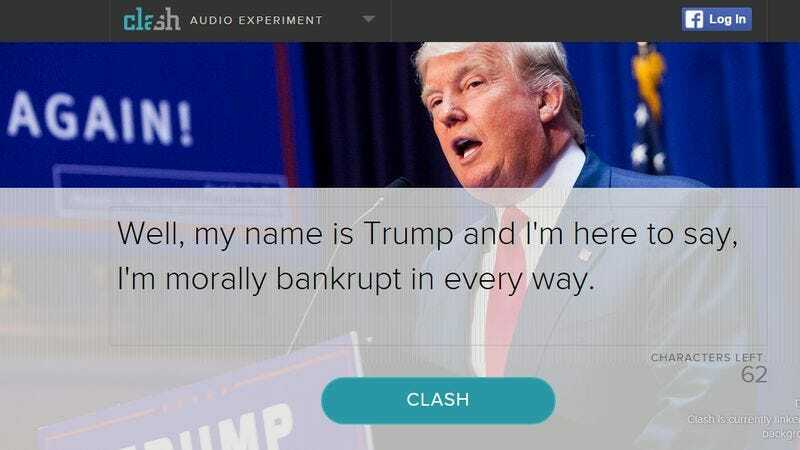 Pastore is the creator of Clash.me, a self-described “audio experiment” that allows people to type in tweet-length messages, 140 characters or fewer, and play them back in the voices of various celebrities, as culled from, in the site’s own words, “popular music, movies and TV, viral YouTube videos, historic speeches… and especially Donald Trump!” Those who wish to skip directly to the application’s Trump feature may do so here.